Discussion in 'Searching for Someone & Military Genealogy' started by Pieter F, Oct 27, 2018. Trooper Frederick Lester (7949566) died accidentally on 30/31 July 1945 in The Hague, The Netherlands. He was serving with the 3rd/4th County of London Yeomanry (Sharpshooters), RAC. In my efforts to find out more about the circumstances of his death, I found out that the unit was in North Germany at the time and the war diary makes no mention of Lester's death. Being so far away from his unit, I assume he must have been at leave at the time. If so, how do I find out what happened to him? Thanks for this TD. The CWGC has no additional information on him, so his birthplace is a new bit of information. 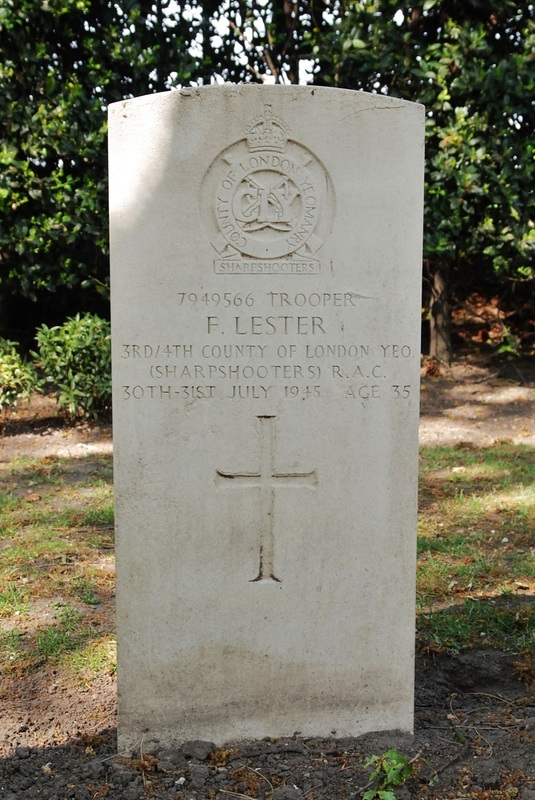 Trooper Frederick Lester 7949566 3rd/4th County of London Yeomanry (Sharpshooters) R.A.C. Employed as a labourer in a silk factory residing at 8 Denacre Avenue, Long Eaton, Derbyshire in 1939. Thanks Guy, that information might be very useful!